Since I’m on vacation this week, I decided to hit the BuzzUp downtown at Chacarero. Only one person, Guido Stein, showed up, but we had a fun hour chatting about our lives, our jobs, social media and this wacky digital world we inhabit. We were talking about communities at one point, and he said something really interesting. Nowadays, everyone talks about community management and building community. But as Guido put it, what we’re really doing with social media is rebuilding community. As a people, we’ve become more numerous, more spread out — we no longer live a stone’s throw from the village square, and we no longer squat around the same fire. Social media helps make the world around us smaller. It brings the fire to everyone. To borrow a metaphor from one of Guido’s pastimes, we are knitting the community back together. As I was thinking more about our conversation today, I realized that we are not only rebuilding and reclaiming communities; we are discovering communities we didn’t know we had. For instance, in the course of conversation (and post-BuzzUp tweets) Guido and I learned that we had two mutual friends — folks outside of the local social media sphere, at that! But for me, the even stronger case in point is the group of folks in the higher ed web marketing world in whose orbit I have been lucky enough to find myself. This community existed long before I came around, our field and interests overlapping unbeknownst to myself. But thanks to Twitter, we can find each other and knit ourselves together more closely. Some things feel so natural, it is hard to believe they are new. Tim Nekritz’s post about the community-building power of Twitter really resonated with me — partly because it was the antidote to my “Social Media is Soylent Green” post from a couple weeks back, but mainly because it echoed one of the highlights of my year — connecting with this new group of people, both online and in person. I am happy to not only have expanded my network of contacts and colleagues, but also to have made some excellent new friends. So maybe social media isn’t so much about creating something new. It’s also about discovering (or rediscovering) something that has always been there. 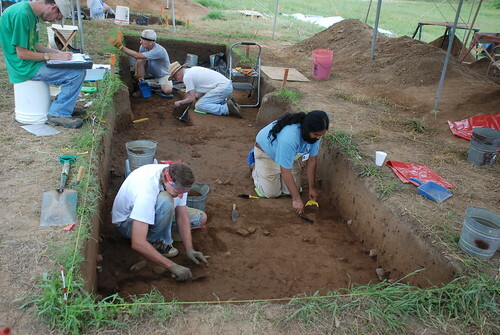 Perhaps we are like archeologists, brushing away the dust to reveal the rich worlds around us. Over the past week or so, it feels like every other blog post I’ve read has either been a year-in-review or a list of goals for 2010. I’m tired of reading them, to tell you the truth. Not because they’re not interesting, especially if they are by my friends, or don’t have valuable bits of insight or advice. Often, they do. Maybe it’s more than I’m just not ready to read them, so I’m tired of seeing nothing but. I know that right now is the time I am supposed to be tying up loose ends, putting 2009 to bed and planning in earnest for the year ahead. But I’m not thinking about my three words. I’m not thinking about anything. There is a time for planning, but I’m not there yet. Right now, I am on vacation. I am running errands, going out to eat, seeing friends and family, working on some personal projects, going to the movies and sleeping in. That’s about all I can, or want to, handle. Let me tell you something: A year ago today, my grandmother died. That set the tone for 2009: tumult. Many good things happened this year, of course, but overall it was a difficult one. So allow me to indulge myself, for this week, in not thinking beyond my next meal or social engagement. Allow me to say good riddance to 2009 by not even giving it the privilege of incubating my dreams for the year to come. This evening, I made a playlist of songs about how awesome 2010 will be, and that is the extent of strategic planning that I can handle right now. Call me next week. I will be sorting out my life and planning my life, both personal and professional, in earnest. But right now, I am neither reflective nor academic. Right now, I am done. It’s more of an ode to long-distance bus travel (which I do love), but it also comes to mind when I think of my affection for public transit, which centers around the bus. I feel like a lot of people utter that song title when considering my transportation habits. In fact, I only have a bus pass, not a subway pass, since my office is just one short bus ride away. This means that often, even when traveling between two locations along the same subway line, I will take the bus if I have the time to spare. I not only save $1.70 by doing so, but I get the pleasure of a bus ride. But why do I like the bus so much? This question — and its answer — came to mind on Wednesday evening. I was attending a friend’s performance at 10PM, and I had a couple of hours to kill between dinner and then. 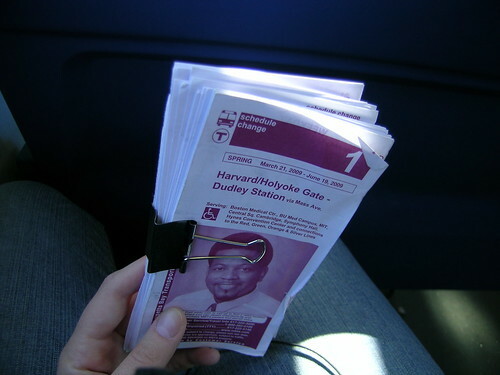 I bummed around Harvard Square for a while but eventually decided just to get on the No. 1 bus, which would take me to the establishment in question. But as I approached the bar, I just stayed on the bus. In fact, I rode through Cambridge, past MIT, across the Mass. Ave. bridge, all the way to the Christian Science center. In this instance, the bus served two purposes: one, I got to take advantage of some free time to ride one of the MBTA’s better bus routes into the city and back to visit one of my favorite spots (on a listless evening, seeing the Christian Science Center and the Boston skyline at night will perk you right up); two, I got to enjoy being ferried through Boston and Cambridge, taking in the people around me and the sights along the way. The bus lets me down, it’s true. Like Saturday, when I stood outside in the cold and bracing wind waiting 30 minutes for a late bus to Davis Square. Or when humanity’s quirks and eccentricities extend beyond good people-watching fodder and either begin to annoy or cause discomfort. Or when it inevitably speeds past juuuuuust as I get to the stop. It’s for those reasons that I can understand why many people dismiss the bus as weird, dirty, not dependable, inconvenient, etc. So, why does my love of the bus persist? 1. The aforementioned people- and city-watching. Sure, you can observe characters and assess people’s reading material and peer at your neighbor’s iPod and speculate wildly about the backstories of the people around you on any mode of transit. But the bus trumps the subway in my book mainly because you can see what’s happening beyond the vessel. No matter how familiar the route, I can still lose myself in gazing at storefronts and intersections and landmarks. Dark tunnels have nothing on the outside world. 2. Making the city bigger. One of my favorite routes is the No. 8, which I used to ride nearly its entire length from my workplace at JFK-UMass to Kenmore Square, because as a 22-23 year old, it provided a great look at the city beyond the Copleys and Faneuils. The bus also empowers me to go on epic urban adventures where, moreso than driving on the highway or riding the subway, it’s about the journey as much as it’s about the destination. I like having to do nothing more than pay attention to where I need to get off, and I can extend my reach beyond the spokes of the subway and get to some pretty cool places. And it’s not just about the MBTA. I take a certain amount of pride in conquering the above-ground public transit options of any city I visit. This year, I’ve done it in both Brussels and San Francisco. In the latter, I took the bus all the way from the Castro to the Golden Gate Bridge, which was almost as much fun as visiting the bridge itself. 3. The bus is my mobile office. It’s where I do a significant amount of my reading, music listening, web browsing (hooray for the Blackberry) and social planning. It’s amazing how much I can get done on the 10 minute bus ride to work. 4. A sociological exercise. If you get on the bus by yourself, you’re likely going to immerse yourself in some activity for the duration of your ride, whether it’s reading, reading e-mail, chatting on the phone or simply gazing out the window or getting lost in thought. Riding the bus is a very solitary experience. But at the same time, it’s also extremely communal. Yes, you’re having a private experience, but so are the 20 other people sharing this small confided space on wheels. Whether in passing or in greater depth, chances are you have sized one another up or at the very least taken note of each other’s presence. Think about “Lost.” That series addresses the question of what would happen if you somehow became inextricably bound up in the lives of the people with whom, by chance, you are sharing a transportation experience. It’s a fascinating idea. I admit to having thought, while riding the bus, about what would happen if I was suddenly thrust into a shared experience with my fellow passengers, a la “Speed.” Though hopefully with less Keanu Reeves. 5. A feeling of peace. Call me weird, but when I get on the bus — particularly when I am settling in for a ride of some duration — I am filled with a sense of calm. I feel fortunate for having an accessible, affordable means of crosstown transit, not to mention one that (most of the time) affords me a seat with a view and the time to catchup, daydream or nap. It feels like a luxury. Perhaps for someone like me, who sees public transit as more of a right than a privilege, it is dangerous to admit that. But spaces where we are allowed to be quiet and left to our own devices feel few and far between nowadays, and they should be treasured. I was having dinner with a friend the other evening and was telling her about this post. (It was this same friend who found the above pin at a local vintage shop a couple of years ago and gave it to me as a gift.) She recalled how when she moved to Boston 15+ years ago, she liked it fine, but it was on the bus — watching the city unfold around her as she advanced toward her destination — that she fell in love with it. And that sums it up more perfectly than I ever could. In the wake of a barrage of lists, countdowns and obsessive recapping of the year/decade/century/millennium in music, allow me to offer a few — just a few! — leftover, but important, nuggets. Where do I find out about all of this stuff? I mainly learn about new music from two sources: MP3 blogs and the radio. The two radio stations I listen to are WERS, the Emerson College station based here in Boston, and KEXP in Seattle. I listen to WERS early in the morning, and I listen to KEXP streaming online in the office. I highly recommend both stations. Relatedly, WERS has exposed me to (or reminded me of) a host of artists that I either missed the first time around or never full appreciated how awesome they were — The The, Pete Townshend, The Band and Squeeze, to name a few. A site that has been extremely handy for picking up the back catalogs of these artists is YourMusic. It’s more or less the heir to the Columbia House/BMG mantle, but their model is more like Netflix nowadays: set up a queue, get a CD every month for $6.99, shipping included. You can also make one-off purchases for the same price. They present the same limitations of artists and labels we all enjoyed with Columbia House and BMG back in the day, but if you’re looking to pick up a greatest hits comp or fill out your collection of a popular artist, it’s a great, affordable resource. Just the other day, in the wake of the Top 100 project, I added Nine Inch Nails’ “Year Zero” to my queue. Recent WERS-inspired purchases from YourMusic include Sinead O’Connor’s “I Do Not Want What I Haven’t Got,” the best of The Jam and Joe Jackson’s greatest hits. In my 2009 in review post, I mentioned my outlook on what might be the top 10 albums of 2010. But Stereogum has a far more comprehensive roundup, with several selections I hadn’t known about that made my mouth water. The secret? Social media is made out of people. People are wonderful, to be sure. But we are also bound up in ego, ulterior motives and passive-aggression. We are flawed creatures. At first glance, the social media world seems full of shiny, happy people — personalities, really. We put our best face forward because we know it is being indexed in real-time search. On Twitter, I follow a lot of perfect strangers, many of whom are some of the movers and shakers in the Boston-area social media and web marketing world. I find many of them interesting, and I find their work interesting. Is the interest returned? Maybe, maybe not. But as we are wont to do in this realm of ambient intimacy, you get attached and you follow along with their lives, both personal and professional. It’s pretty easy to trace the dotted lines connecting the people in that sphere. And when it comes to some of Boston’s bright lights in social media, it seems those lines are more solid than dotted. It’s a tight group, with a few obvious ringleaders. And that’s fine. They’re all nice people doing good work. But on Monday, I picked up on a bit of a disagreement between one of the main organizers of the tweetup scene in Boston and another prominent social media personality who happened to be organizing a tweetup for this week, one that was drawing the usual suspects (and I had considered attending). I was only able to infer the existence of the conflict through a series of cryptic, passive-aggressive tweets (and retweets). What’s the underlying issue? Hard to say. Maybe it’s about trust, genuineness, perceived disrespect, or all of the above. There’s drama there, for sure, but no one’s explicitly talking about it. Just around it. To me, the outsider aspiring to connect with these folks and their community, seeing these exchanges is confusing and off-putting, on multiple levels. In a medium that prides itself on openness and community, it was frustrating to see sniping and passive-aggression between some relatively popular folks — leaders, really — in this scene. When this becomes transparent, the illusion of social media is shattered. It’s not that this inner circle is way cooler than I am; they’re subject to the same crap I have to deal with in my friendships and work relationships and on the bus. They’re just people, no better. I don’t exclude myself from this. I’ve certainly hopped on bandwagons ill-advisedly, piled on unwarranted criticism and tweeted before I’ve thought. It’s not how I like to carry myself in a mostly-professional forum. I try to be self-reflective and not behave that way, both online and off. But, being human, I’ll screw up from time to time. Even in what professes to be the most free and open mode of communication, we still have our human foibles to contend with. We still have our rivalries, attitudes and dramas. It’s inavoidable. Everyone does such a good job at putting their best foot forward, it stands out even more when they stumble — especially to an observer like me. I surprised myself with how disappointed I was by this particular exchange. A higher bar had been set, and I hadn’t realized that until someone fell short. Perhaps I had been naive or starry-eyed — these folks are like mini-celebrities after all. But in the end, it was just the emperor’s new clothes. Being reminded of the ugly truth — that social media is made of people — is actually refreshing, and makes me feel less covetous and more complacent. I should be more content to simply do my own work, find my own way and let the tweets fall where they may.